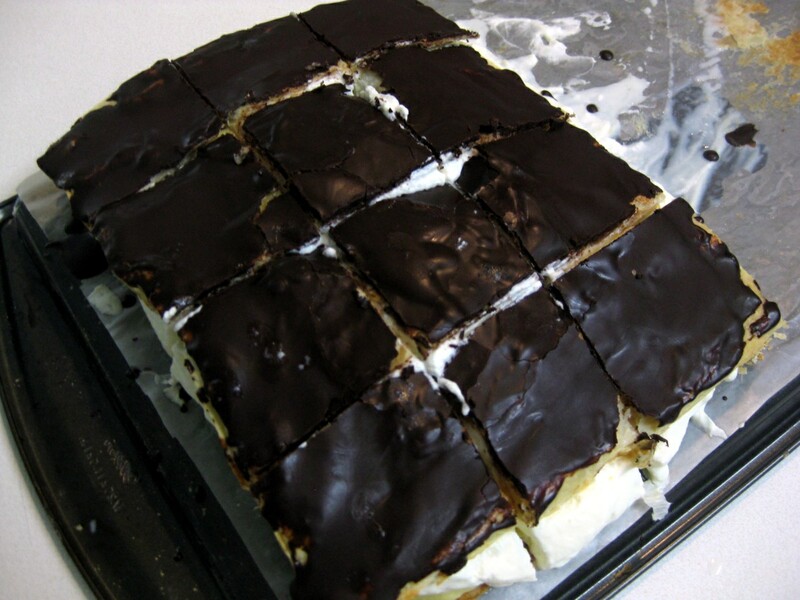 Something I really I miss from my childhood are the Slovak pastry shops (cukráreň). Walk in, and the first thing you’ll notice is a glass display case full of assorted pastries of all kinds of shapes and flavors. They are a bit of a relic from the old era (it seems to me that under the old centrally planned system, every town had to have at least one cukráreň), and are now slowly being replaced by coffee shops that specialize more in coffee than in pastries, but a cukráreň is not to be missed on your travels to Slovakia! Such fancy pastries are called zákusky. This is opposed to koláče, which generally refers to simpler, home-made baked cakes and sweet breads. There are so many types of zákusky that you could probably create a website dedicated just to them. One of my favorites are fruit and jelly slices. The other one is kremesh (krémeš or as we called it in my family, krémeška). 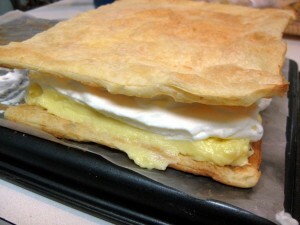 Here is a recipe for this napoleon-like pastry. In theory, making kremesh extremely simple. 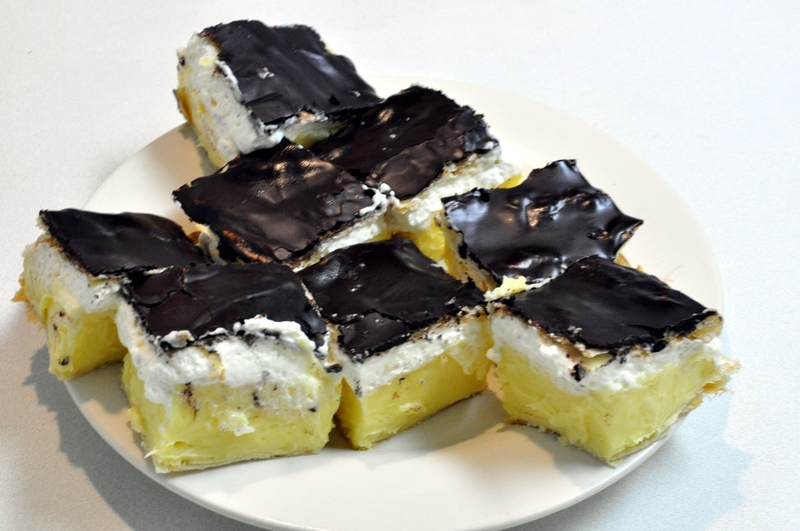 Baked store-bought puff pastry sheet, make vanilla pudding, add whipped cream, top with chocolate, done! However, the first time I tried to make it, the result was anything but spectacular. The cream burned in parts and at the same time was too thin, and just oozed out from between the pastry sheets. This second time I used a different recipe and a double boiler with much more success. This recipe is adopted from dobre-jedlo.sk. Before we get going, take out one sheet of frozen puff pastry out of the freezer and let defrost. Combine the milk, yolks, corn starch, flour, vanilla sugar, and powdered sugar. 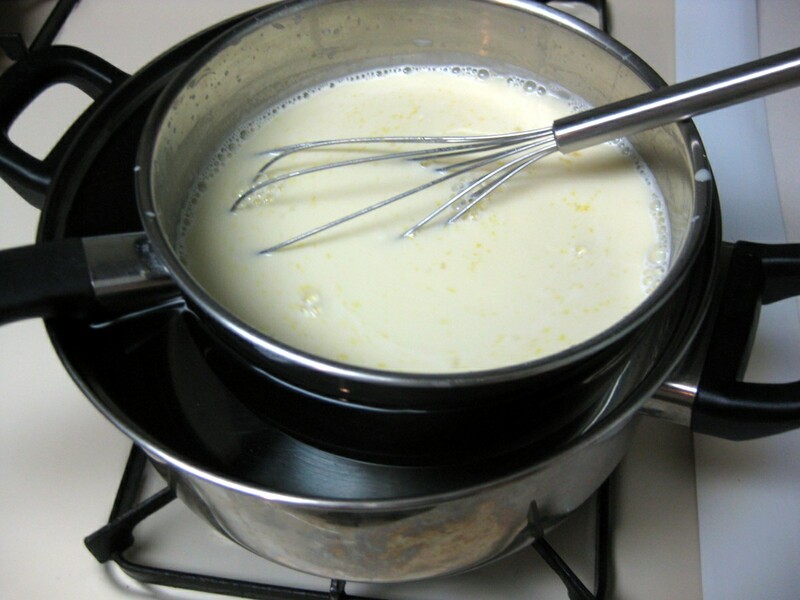 Whisk well together and then cook using a double boiler until the cream thickens. This basically means you place the small pot in another larger pot containing boiling water. This will keep the pot to the 212F. 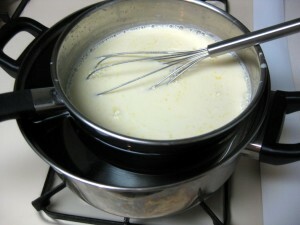 Otherwise, cook on very low heat and keep stirring continuously so the cream doesn’t burn. 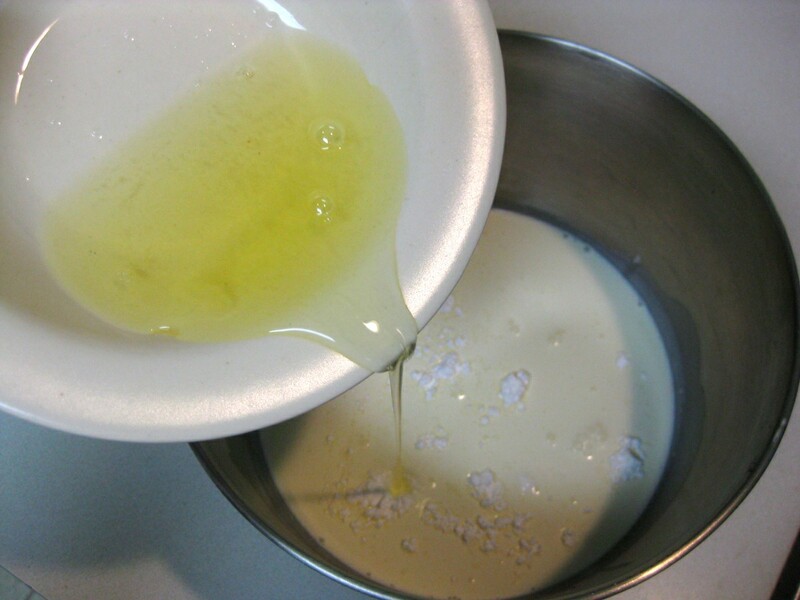 However, when I made the cream using the ingredients above, the cream was way too thin. The original recipe on dobre-jedlo.sk called for two packets of “Zlatý Klas”. I have never seen this in the US, but to the best of my knowledge, it is corn starch, perhaps modified with some coloring and vanilla flavor. The recipe also didn’t specify how big the packets should be, but from the image they appear to be 40g each. Yet, with that amount, the resulting cream was too milky and too pale in color compared to the photograph. So to make my life easier, I just put in one packet of vanilla pudding. The cream is basically is nothing else than vanilla pudding: milk, corn starch, sugar, and vanilla flavor. Bring to boil, stirring, and let stiffen. Let the cream cool in a cold place or the fridge. I used store bought puff pastry to make the top and bottom dough layer. 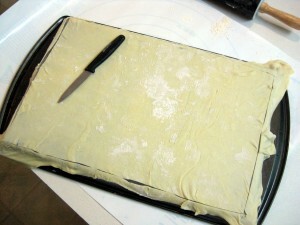 Of course, feel free to make your own puff pastry dough if you want. But otherwise, just take one sheet and roll it to 11×7 inches, which is the size of the baking pan I used. Take the baking pan, turn it upside down, and place wax paper on top of . Cut away any paper that sticks over the edges (this will keep it from burning). Place the dough on top, and poke generously with a fork. This is to keep the dough from puffing up. Bake in an oven preheated to 400F for 10-15 minutes, until light light brown. Decrease temperature and let sit in the oven for few more minutes to crisp the dough up. While the custard is cooling down, and the baking is done, prepare the whipped cream. 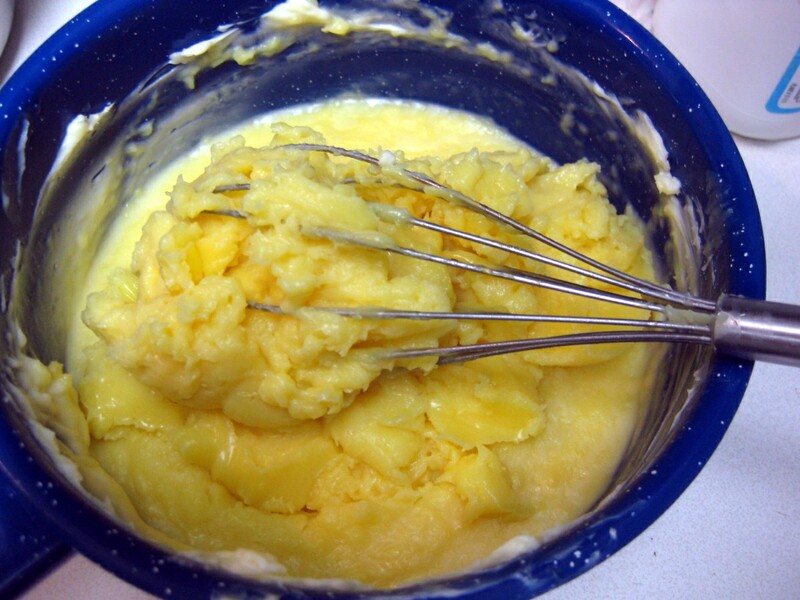 I combined the egg whites with heavy cream, sugar and baking soda. Whip until stiff. 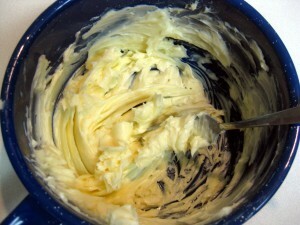 Next whip two sticks of butter or margarine. Work the cream into the butter, but only once the cream is cold. Otherwise the butter will melt. Also add a shot of rum if you like (I didn’t because I didn’t have any). 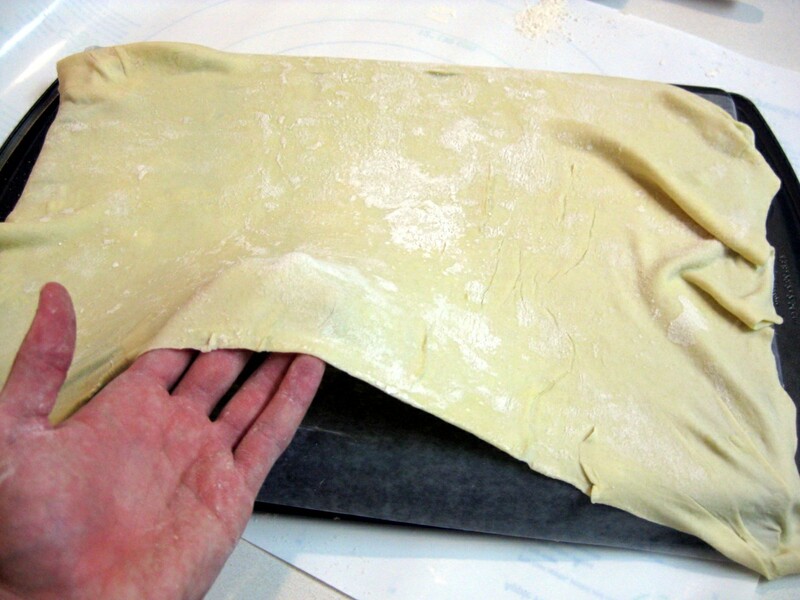 Cut the puff pastry in half. Top one half with the cream. Try to make it as even as possible. 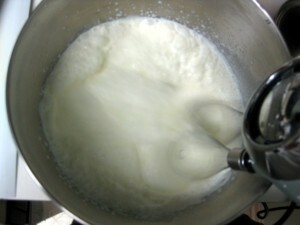 Then top the cream with the whipped cream. Don’t forget to eat anything that falls off the sides… Top with the other pastry sheet. Next melt chocolate. This is simple, just melt 3 squares of dark, unsweetened chocolate, with about the same volume of butter, and a spoonful of powdered sugar. Heat on low heat, stirring. Take off the heat when bits of solid chocolate still remain. These will melt from the liquid and doing this will result in harder (more tempered) chocolate layer. 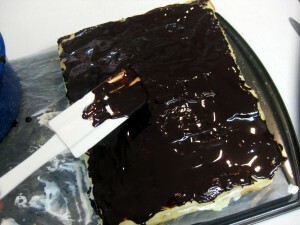 Cover the top pastry layer with the chocolate. Place in the fridge for several hours, best overnight. Well I couldn’t wait that long, I ended up cutting the krémeš after only about 3 hours. Cutting is bit tricky, especially if you want to make the pieces look pastry-shop like. Make sure to clean your knife between each slice. It also helps to do this in a cold place, otherwise if you do it in a 90F heat we had here in D.C., the chocolate will start melting and will smudge up the yellow cream. Make sure to cut the bottom pastry layer too. And that’s it. Enjoy! If you want to see how these look when done professionally, click here or here. Sometimes the top is simply sprinkled with powdered sugar instead of chocolate. And check out honey slices if you like sweets. I would love to try this but I’m a little hesitant as I’ve tried about 3 other recipes from the site & they’ve all come out horrible (mostly because the measurements were very off). Also, what type of pastry sheets are you purchasing? The ones at my local market do not look like yours on the foto–they come in 3 sections –not a flat large one like the one pictured above. HELP! Thank you!!! Hi M, sorry to hear that! What did you try making before? I took a photo of the ingredients but forgot to copy it to my computer and I am currently on the road. I’ll add it when I get back. But I used the puff pastry from Pepperidge Farms, http://www.puffpastry.com/ (there is a picture of the box in the top right corner). It is folded into three sections, but you have to unfold these before you roll the dough out 🙂 Anyway, good luck, this dessert is actually quite easy, assuming the custard turns out. 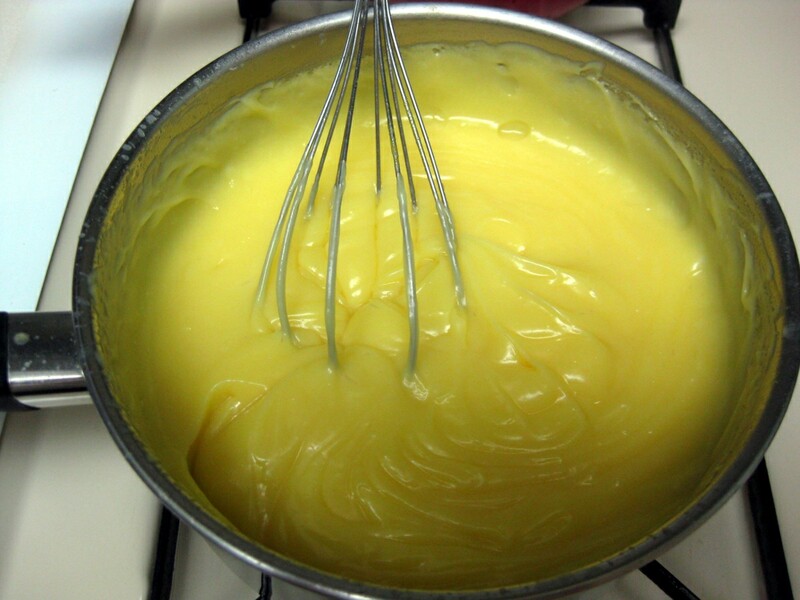 I suggest you try making the custard first. 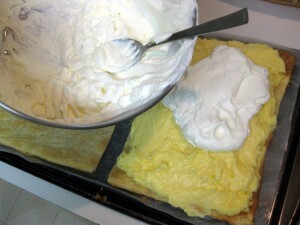 If it turns out good, then bake the pastry and make the whipped cream. Very good dessert! Very creamy! I was lucky enough to sample the ones Lubos made. With the custard and chocolate it tasted like a French Éclair pastry. Well done. 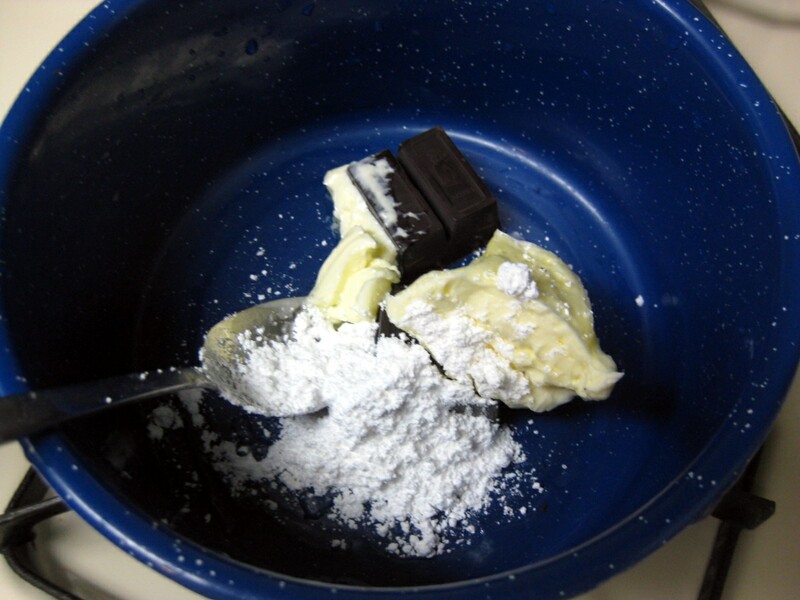 By the way, some of the recipes I found also used something called “whipped cream stiffener”. Dr. Oetker sells it, http://www.germandeli.com/droe3p.html. But I have never seen anything similar in regular grocery stores. Any idea what is a good substitute? 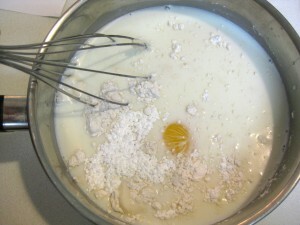 I learned from my Oma to add a bit of sugar or cream of tartar to the whipping cream as its mixing. This adds support as the cream increases in volume. There is a fine line between stiff peaks or becoming butter. The bowl and whippers need to be cold too. I put them in the freezer for 5 minutes. Love the site! Am working on our family recipes from Svedlar in Nova Spisska Ves near the Tatra. I am the I rest one to write them down. My brother has shown an interest in making some things, especially steamed, plum filled Buchty. Oops…I’m the first one to write them down. 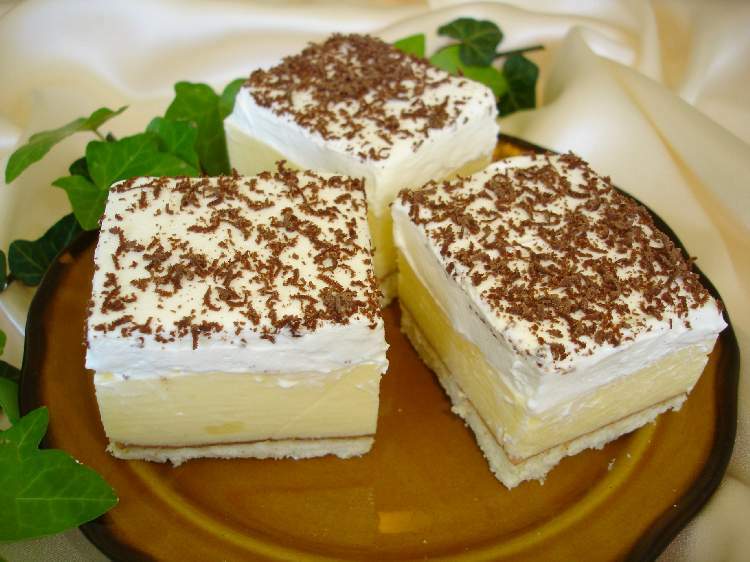 I cut the top pastry into squares before putting them on the top of custard. Then it is easier to cut the pieces without getting the custard out. Diky Lucia. I think I’ve seen that same tip mentioned somewhere else too. It’s definitely a good idea, as cutting these things cleanly (like they are in pastry shops) it’s quite impossible. Perhaps freezing them before cutting them would work too. I must say I have found this website by mistake. But, I am very happy to see my childhood foods in front of my eyes! Most of these recipes *look* like what I used to eat when my father did all the cooking! I was too young to try to remember the recipes though! M – you mention that most of the recipes are troublesome for you. I find the best way for Slovak cooking is to use weights (40g of something, for example) rather than cups (ex. of flour). When flour is packed into a cup, it will most definitely weigh more than what was intended for the recipe. Does this make sense? I can not wait to have a baking party this weekend! I just tried this but the egg whites/cream did not come out right. 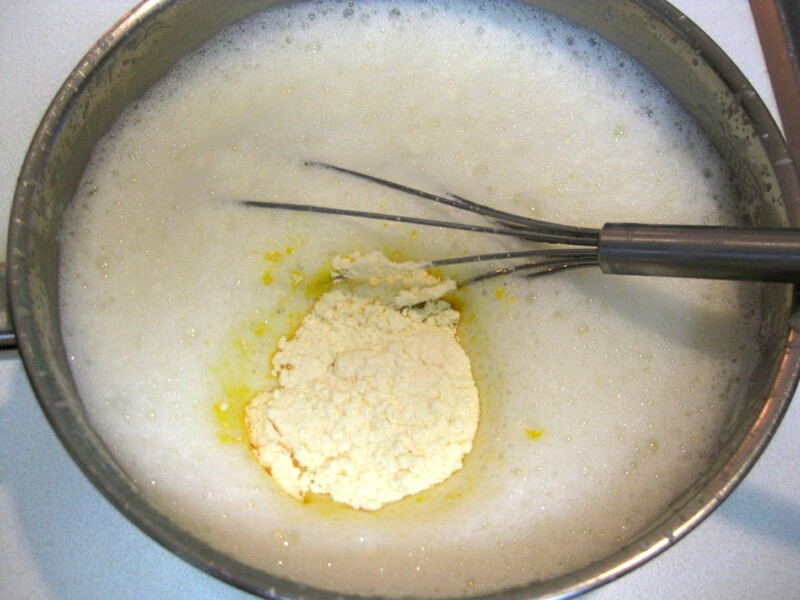 Do you add the egg whites to the cream and then beat? I think I did the opposite. But even without that layer my Slovak wife liked it. Also the pastry puffed up too much. I will try again next weekend. I hope you try to make veterniks some time. 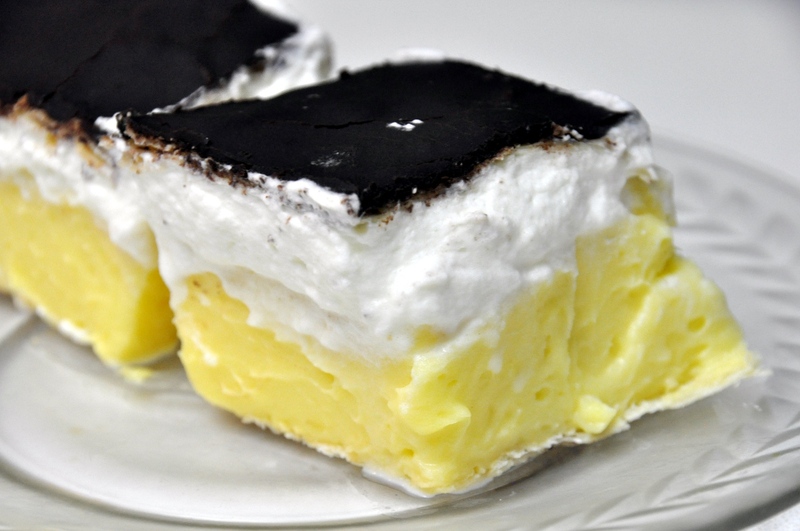 this little peice of heaven is in even pastry shop in slovak but you have to get there early it goes fast! I’ve been reading Kaffeehaus by Rick Rodgers and he has a recipe for Francia Kremes and many other cakes, strudels, pancakes, dumplings, etc. Lots of pictures, too. Thank you so much! Absolutely heavenly! I came to Australia from former Czechoslovakia after the Russian invasion. I do not recall ever seeing these at that time. On my trip around the world I had something similar in Quebec/Canada, they called it Napoleon vanilla slice. Delicious. I have Slovak recipes that call for heru. What is this. Please let me know. Thankyou Mary. 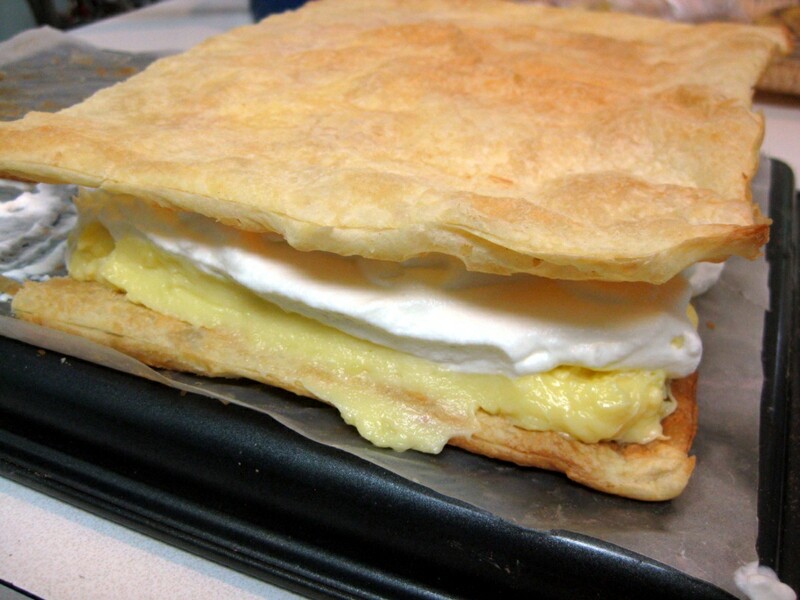 When I make a similar Hungarian dessert, I fold the whipped cream into the custard. Only one layer of filling. Tell me what brand of the pudding u use?